You know, sometimes it is the simple things that don’t get talked about. Everyone assumes you know how to do basic things like, oh you know, how to hard boil eggs. I did not learn how to hard boil an egg perfectly until I was in my 30s, no lie. I always boiled them to death so that they were dry and rubbery. Or, I took them off the heat too soon and … ick. So, assuming that I am not the only egg-challenged cook in the world I decided to make sure that, once and for all, I had contributed to the perfect hard boiled egg club in a significant way. Place up to 12 eggs in a heavy enamel pan if possible. I use my Le Creuset. Be sure not to crowd them. Cover the eggs with tap water to a depth of two inches. Add one teaspoon of salt and one teaspoon of vinegar. This helps to keep them from cracking and if they do crack the white will not ooze out. Bring to a boil. Once the water hits a full, rolling boil set the timer for one minute. After one minute remove the pan from the heat and cover it. At the end of the 12 minutes take one egg out and plunge into cold water. Peel to check that it is done. If it isn’t done let the eggs sit another 2 minutes. Crack the shells and place in cold water, unless you are going to be storing them in the shell. Yep it is that easy. Use eggs that are older for easiest peeling. If you buy them, buy them about a week ahead. If you have chickens try holding them for a week and a half. If there is a green ring around the yolk it means the egg was cooked too long and the natural sulfur and iron in the egg reacted to the yolk. Sometimes they will go green if you have a lot of iron in your water as well. If the latter is the problem just cook them in bottled water. The green is not a problem other than visually, you can still eat the egg. Eggs will keep for a week or so in the refrigerator when they are boiled. Keep them in a covered container. You can also store them peeled, in some lightly salted water, covered. 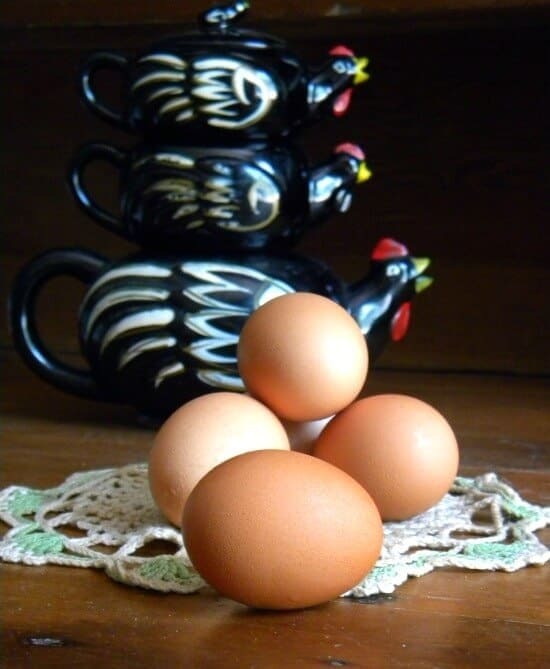 The water keeps the egg from drying out but it is a good idea to change the water daily. You can also store peeled eggs in an airtight container covered with damp paper towel or a tea towel. Regardless, eggs must be stored in the refrigerator. 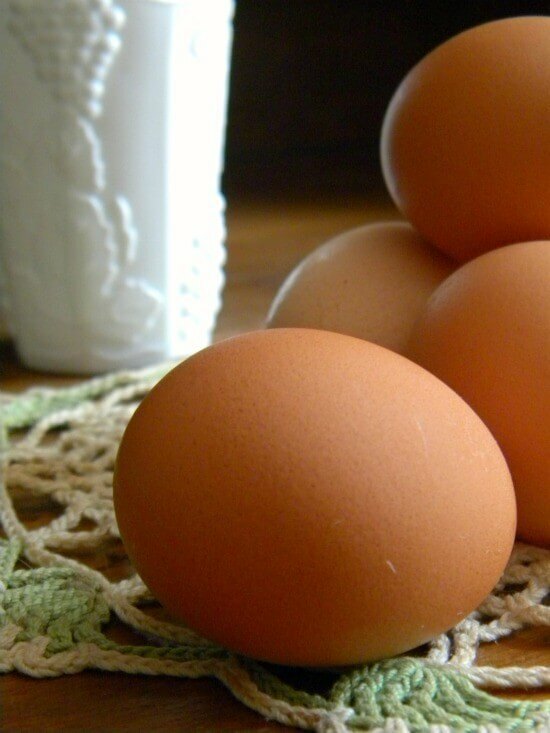 You can keep boiled eggs at room temperature for no more than two hours. If you are using them in a buffet or similar application place the plate or bowl of eggs on/ in a larger bowl of ice to keep them cold. It’s a good idea to keep boiled eggs on hand to add to salads, make a quick batch of deviled eggs, or as a quick breakfast, lunch, or snack. Make tea eggs. Once the eggs are boiled, crack the shell but do not peel. Allow to soak in Lapsang souchong tea (a smoky, full flavored black tea) for several hours or overnight. When you peel the eggs they will have a marbled look and a slightly smoky flavor. Pickled them. When I was growing up we always had a jar of pickled red eggs in the fridge. I’ll try to remember to share the recipe soon but basically you just need to cover them with the juice from a jar of pickled beets. They will last a freakishly long time. Chop finely and use as a nutritious garnish for green beans, asparagus, and other vegetables. Some people like hard boiled egg chopped up in tuna salad (not me). So, that’s it. Easy. Perfect. Cheap. Healthy. Keep some on hand.